Crossan: Jesus was a "peasant with an attitude"
"If Hell were not already created, it should be invented just for you." Other critics have called him "demonic," "blasphemous" and a "schmuck." When John Dominic Crossan was a teenager in Ireland, he dreamed of becoming a missionary priest. But the message he's spreading about Jesus today isn't the kind that would endear him to many church leaders. "I cannot imagine a more miraculous life than nonviolent resistance to violence," Crossan says. "I cannot imagine a bigger miracle than a man standing in front of a tank in Tiananmen Square." In another time, Crossan's views would have been confined to scholarly journals. But he and his best-selling books, including the recent "Jesus: A Revolutionary Biography," have changed how biblical scholars operate. Crossan believes the public should be exposed to even the most divisive debates that scholars have had about Jesus and the Bible. He co-founded the Jesus Seminar, a controversial group of scholars who hold public forums that cast doubt on the authenticity of many sayings and deeds attributed to Jesus. 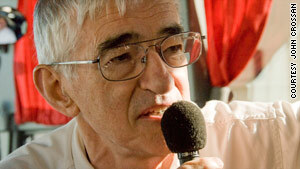 John Dominic Crossan says even the writers of the Bible disagreed about Jesus' message. The 77-year-old Crossan has built on the seminar's mission by writing a series of best-selling books on Jesus and the Apostle Paul. With his silver Prince Valiant haircut and his pronounced Irish accent, he's also appeared on documentaries such as PBS's "From Jesus to Christ: The First Christians" and A&E's "Mysteries of the Bible." Crossan's overarching message is that you don't have to accept the Jesus of dogma. There's another Jesus hidden in Scripture and history who has been ignored. "He's changed the way we look and think about Jesus," says Byron McCane, an archaeologist and professor of religion at Wofford College in South Carolina. "He's important in a way that few scholars are." Crossan is also reviled in a way that few scholars are. Some critics say he's trying to debunk Christianity. Some question his personal faith. At a college lecture, Crossan says an audience member stood up and asked him if he had "received the Lord Jesus" as his savior. Crossan said he had, but refused to repeat his questioner's evangelical language to describe his conversion. "I wasn't going to give him the language; it's not my language," Crossan says. "I wasn't trying to denigrate him, but don't think you have the monopoly on the language of Christianity." When asked if he is a Christian, Crossan doesn't hesitate. Crossan says he never planned to be a Jesus scholar but was drafted to play that role -- by the Roman Catholic Church. He had other plans. He grew up in a small town in Ireland reading adventure stories like "20,000 Leagues under The Sea" and reciting poetry with his father on long walks. He wanted adventure and travel. The missionary priests who visited his boyhood school with stories of mission trips to Africa seemed to offer both. Crossan says his father, a banker, and his mother, a housewife, didn't push religion on him. He was raised in a traditional Irish Catholic church where faith was "undiscussed, uninvestigated and uncriticized." "I didn't grow up in an atmosphere where the Bible was stuffed down my throat." 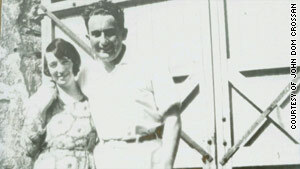 John Dominic Crossan's parents, Daniel and Elizabeth, never pushed religion on him. Yet Crossan immersed himself in the world of the Bible for the rest of his adult life. When he entered a monastery at 16, church leaders told him they wanted him to be a scholar because he had already taken five years of Latin and Greek. His days as a priest would end, though, because of the same forces that shaped the rest of his career: the clash between church dogma and scholarly truth. Crossan says it was "bliss" being a priest and scholar in the mid-1960s because the Roman Catholic Church had instituted a series of modernizing reforms. But conservative church leaders fought those reforms, and Crossan says they pressured him to steer his research toward conclusions that reinforced church doctrine. "It's like you're a scientist in research and development, and you say that this drug is lethal, and they say, 'Find something good in it,' '' Crossan says. He left the priesthood in 1969 after he angered church leaders by publicly questioning the church's ban on birth control. He married, and settled into a career of teaching and writing books that were read primarily by other scholars. Later, however, Crossan would anger church leaders again. In 1985, Robert Funk, a New Testament scholar, asked Crossan to join him on a risky mission: Expose the public to academic debates about the historical Jesus. The seminar was Crossan's first wide exposure to the public. The media gravitated to him because he was a scholar who didn't talk like a scholar. Christianity both admits and subverts the historical Jesus. He became known for his sound bites -- inspired, he says, by Jesus' use of parables to distill complex truths in pithy but provocative sayings. Crossan's public profile rose another notch in 1991 when The New York Times ran a front-page story two days before Christmas on his book, "The Historical Jesus: The Life of a Mediterranean Jewish Peasant." The book became a bestseller, and Crossan followed up with more. He says people were anxious to embrace a faith with "brains and heart," and learn the history behind the text, not just its wording. "When we started out, people thought we were out on the left wing," he says. "Now, I'm talking in about 30 churches a year. ... A lot of this is becoming mainstream." A casual search of Crossan's name online turns up plenty of insults and warnings not to read his books. Crossan says, however, that he's "trying to understand the stories of Jesus, not refute them." Still, his findings often end up challenging some of Christianity's most cherished beliefs. Consider his understanding of the resurrection. Jesus didn't bodily rise from the dead, he says. The first Christians told Jesus' resurrection story as a parable, not as a fact. "Crucifixion meant that imperial power had won," Crossan says. "Resurrection meant that divine justice had won. God is on the side of the crucified one. Rome's' values are a dead issue to me." How about the stories of Jesus' miracles, like raising the dead or stilling the storm? 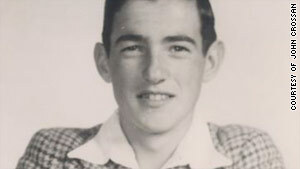 John Dominic Crossan wanted to be a missionary priest as an Irish schoolboy. Most were parables, too, Crossan says. But there were some exceptions. "I'm completely convinced that Jesus was a major healer," he says. "I don't think anybody would talk about Jesus if all he did was talk." People like to talk about Scripture, but Christians should also know history to understand Jesus, Crossan says. In Jesus' time, Rome was forcing many Jewish families into destitution, with high taxes and land seizures. Some Jews advocated violent rebellion, but others opted for non-violent resistance. Jesus called for nonviolent resistance to Rome and just distribution of land and food. He was crucified because he threatened Roman stability -- not as a sacrifice to God for humanity's sins, Crossan says. If you believe in a God that uses violence to "save" humanity, you'll start believing that violence is permissible in certain circumstances, such as suicide bombing or invading other countries to spread democracy, Crossan says. The human addiction to violence, though, is so ingrained that even the authors of the New Testament had trouble accepting Jesus' nonviolence, Crossan says. So they did a little editing. Crossan's proof: Jesus preaches nonviolence at the beginning of the New Testament. By the book of Revelation, he's leading armies through heaven to kill evildoers. "Christianity both admits and subverts the historical Jesus," Crossan says. Is Crossan doing the same -- admitting and subverting Jesus, some wonder? The words "brilliant," "keen mind" and someone who "loves the Bible" are often used by fellow scholars to describe Crossan. They say he is generous with his time, funny and personally warm. "He has real depth of the soul," says McCane, the biblical scholar and archaeologist. "He's spiritual in the best sense of the word. He sees the world as a place where values matter." Yet some also wonder if he unwittingly gives people an excuse to diminish Jesus' importance. Ben Witherington, a New Testament scholar who has written several books about the early Christian community, says Crossan's work allows people to sidestep questions like: Did he come to save the world? Is he the son of God? "It's a user-friendly Jesus that doesn't make demands on someone," he says. Witherington says Crossan is trying to find a nonsupernatural way to explain Jesus and Scripture, and "the shoe doesn't fit." "The stories are inherently theological," he says. "They all suggest that God intervenes in history. If you have a problem with the supernatural, you have a problem with the Bible. It's on every page." If you have a problem with the supernatural, you have a problem with the Bible. It's on every page. One of the most persistent criticisms of Crossan's work is that he's turned Jesus into a peasant insurrectionist because his Irish ancestors battled the British Empire. Crossan says growing up Irish "makes you skeptical about empire." But he says he came of age in the first generation after Irish independence when hatred of the British was not pervasive. Crossan once wrote in his memoir that he learned two things from Irish history: "One, the British did terrible things to the Irish. Two, the Irish, had they the power, would have done equally terrible things to the British (they did it to one another with the British gone)." Supporters of Crossan's work say he's encouraged ordinary Bible readers to ask tough questions. "He opened up space in popular culture for people to think about the history behind the biblical texts," says Timothy Beal, author of "The Rise and Fall of the Bible: The Unexpected History of an Accidental Book." "He invited people back into the texts to question those authoritative sources that have been telling them, 'This is what the Bible says, and you don't need to read it to yourself,' " Beal says. His Irish accent remains, but Crossan is now an American citizen. He lives near Orlando, Florida, and spends much of his time traveling to lectures and appearing in religious documentaries. After spending much of his life in the Roman Catholic Church, Crossan is now an outsider. He hasn't joined a church because he says a priest might deny him the sacraments because of his run-ins with church leaders. "If I attend a local Roman Catholic Church, I would get sucked back into all the debates," he says. "I don't want to spend my life fighting Roman Catholicism." Crossan has also broken with church tradition by marrying. He married Margaret Dagenais, a university art professor, soon after leaving the priesthood in 1969. She died of a heart attack in 1983. Today, his current wife, Sarah, is a yoga teacher and photographer. She's also his partner in travel. Crossan wanted to see the world as a boy. Now he sees it as a man. The two often travel to holy sites, where she takes photos that Crossan later uses in church presentations. Crossan's reputation among traditional Christians was so touchy that it initially affected his relationship with her parents, Sarah said. "We didn't talk about his work with them," she says. "They couldn't handle it. They thought he was so wrong. They loved him as a person, but not his work." Crossan is not worried that his work will shatter people's faith in Jesus. The closer one gets to the historical Jesus, Crossan says, the more extraordinary Jesus becomes. "A lot of people in the first century thought Jesus was saying something so important that they were willing to die for it. If people finish with my books and now see why Pilate executed him and why people died for him, then I've done my job."